I perfected this study and moist white cake, the other day for my daughter’s fifth birthday. She had requested a birthday princess castle cake for a couple of years now, and once my mother sent me Wilton’s Romantic Castle cake kit, I lost all excuses not to make it. I had planned to use fondant on this cake to give it a nice, clean look, but I make my fondant using marshmallows and, unfortunately, I didn’t start the cake until the day of her party. 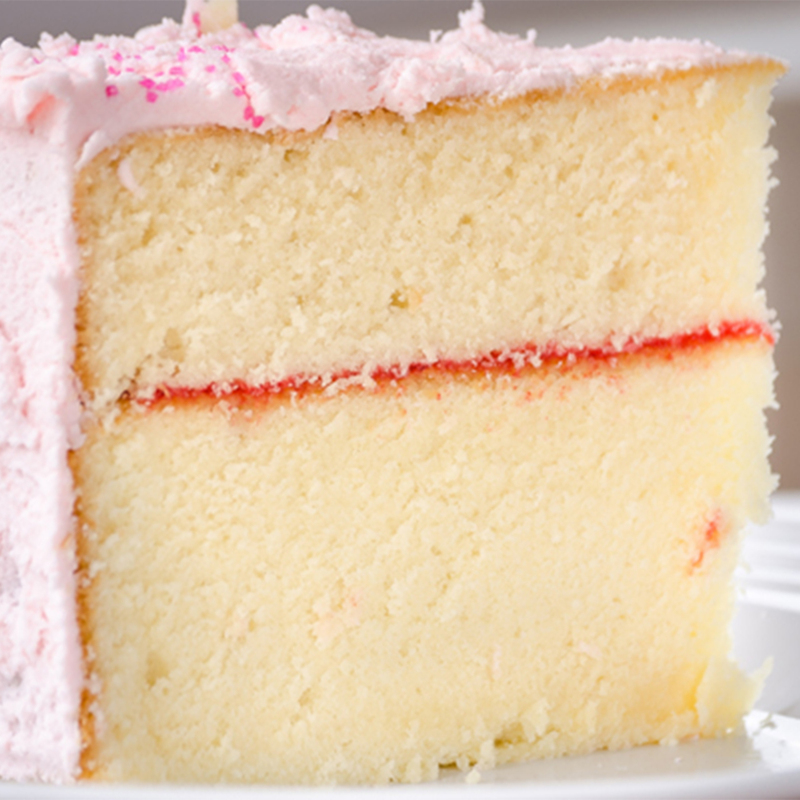 Sturdy white cake with strawberry buttercream it is. I love my wee diva, so I got myself up at 6 a.m., threw some cereal in the kids’ general direction along with the approved flatware, got my apron & headphones, and went to work on this cake. I knew it had to be sturdy since it was going to be two tiers. I don’t care much for fluffy, airy cake, so I wanted to make something with some oomph…a sturdy cake. Think of its density and ability to hold up its fellow tiers as you would Atlas holding up the world. Not only is this cake the strong silent type, but it also has a tender side. As a tear dropped down from Atlas’ cheek, it must have landed in the cake batter, because this cake is moist too. Maybe I should call it the Atlas-Teared cake. Get it? Tiered = Teared, Atlas Shrugged? Ok, if I need to explain my puns…I should just keep them to myself, but then I’ll laugh for no reason and look a little crazier. This particular cake incorporates a thin strawberry filling (in between a three-inch and two-inch layer). It held up a second tier made up by a double layer 6-inch cake on top of it without breaking a sweat. Use this recipe for a moist cake which can hold up to several tiered layers including fondant. The texture leaves a nice crumb which is easy to work with. It’s perfect for decorating! Preheat your oven to 325 degrees and grease/flour your cake pans (I usually cut a piece of parchment paper the same shape as the bottom of my pan and add that on top of the grease/flour as a further precaution against the cake bottom sticking to the pan). In your mixer, add your chilled butter, shortening, and sugar. Mix until creamy…the sugar will be fully incorporated. Combine in a separate bowl, your dry ingredients: flour, salt, baking powder. Alternating: add some of your dry ingredients, then a bit of the milk, then one egg. Repeat until all ingredients are incorporated. The batter will be thick. Place batter into the cake pan/pans and bake in the preheated oven for 40-60 minutes. Keep an eye on it. The lower temperature means longer baking time and each cake size requires different bake times. My 10” round cake 3” in height took over an hour, and my 6” round cake 2” in height took around 40 minutes. If you do not have butter extract, try replacing it with a different flavor extract of your choice. Vanilla is always a fail-safe choice. If you like this dessert, consider one of the others below! Salted butter or unsalted butter and can this be colored? Hi Windsor, I used unsalted for this recipe. If you use salted butter, I would omit the salt from the recipe to compensate. Great question! I’ll update the ingredients to reflect this answer. Though I’ve never done it myself, if you are considering food coloring, I would not be concerned about the effects on the density. This cake is pretty sturdy. Let me know how it turns out. Take care! Hi this looks yummy and perfect for what I need. I have a 17″ open book cake pan, kind of deep – it says it requires 3 boxes of cake mix. I plan on thinned buttercream for sides and fondant for top. My son wants strawberry so was thinking it would be easiest to do a swirl with strawberry syrup instead of trying to mix it in and worry about balancing it out. Do you have any idea how much of your recipe I would need for this? This will be my first homemade cake – the decorating I’ve been doing has just been over box mixes. Hi Michelle, sorry I’m replying so late. Did this work out for you? I took a look at the pan you mentioned and I think one recipe might work. Next time I make it, I’ll measure the number of cups of batter this recipe makes. I think that will help a lot of people decide how much they need. I have used this recipe over and over again for my stacked caked and it stands up beautifully! For the flavoring, I always just use 3 tbsp of vanilla and it’s delicious! It’s not overpoweringly sweet so it pairs nicely with a traditional american buttercream. Thanks for the wonderful recipe!! This cake is incredibly delicious!! It’s a great recipe for birthdays and I just love the subtle almond flavor. Thank you so much for the recipe. 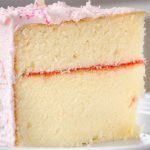 I’ve used this recipe many times for my stacked cakes and it’s always wonderful!! I substitute the almond for double vanilla as I’m not fond of the almond flavor and it’s just perfect. Thank you for a great recipe! Quick question- How many cups of batter does this recipe make in one batch? I’ve never stopped to measure.